The Adventure Cycling Association (ACA), early in 2014, published the Idaho Hot Springs Mountain Bike Route (IHSMBR). The name of the route is a bit cumbersome but descriptive. I told myself it was time to try a dirt road bike tour. I contacted my cyclocross buddy Dennis McCormick who also had the same desire when he heard about the route. The IHSMBR, designed by Casey Greene from the ACA, is a 517-mile route comprised primarily by a series of dirt roads winding through the National Forests of Central Idaho. For the more adventurous, there is an additional Singletrack Options Map featuring 4 singletrack routes totaling 227 miles. 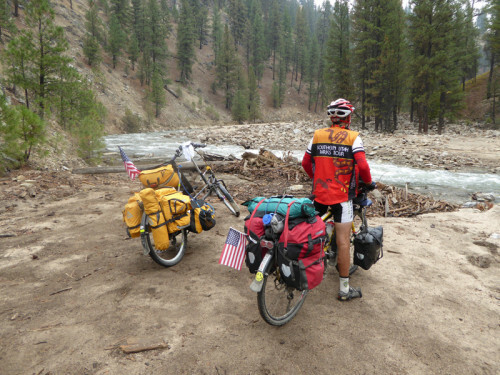 The primary towns that one will ride through on the IHSMBR are Ketchum and McCall, with Boise being about 30 miles off route. Stanley, Cascade and Idaho City are other towns on the route. 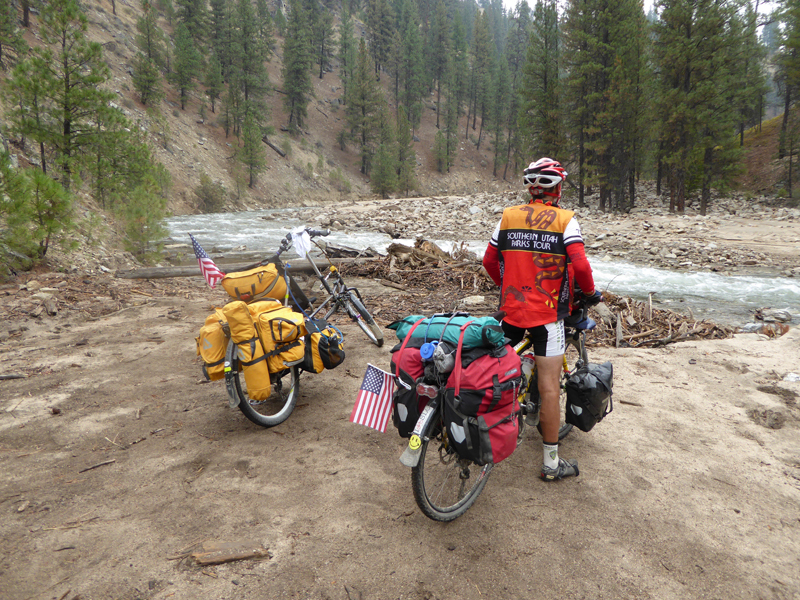 There are several reasons that make the IHSMBR a destination for self-supported bike travelers. First it is a loop route, so a vehicle shuttle should not be necessary. One could also fly into Boise to start and finish the ride. Second, you do not have to do the entire route. There are 2 paved roads that run east to west creating 3 sections allowing for a shorter loop trip if time is limited. For whatever reason, the ACA map only highlights one paved road. 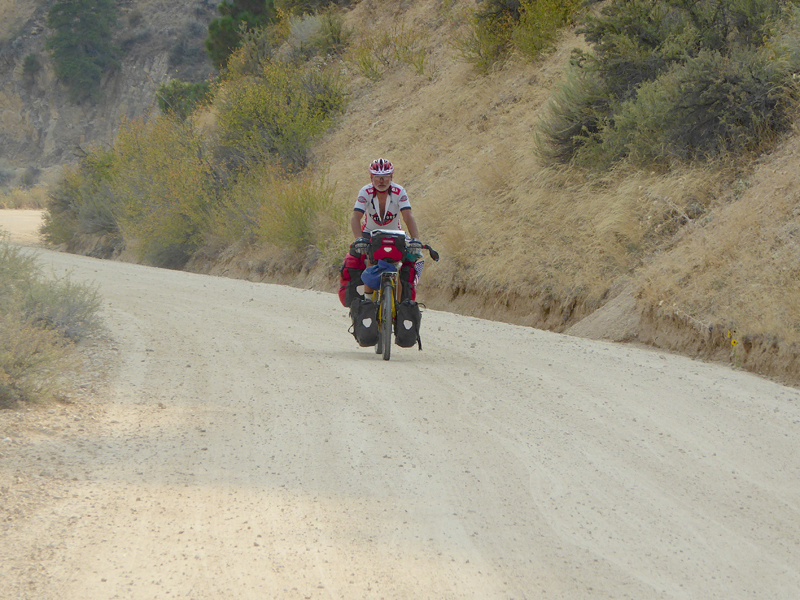 Dennis and I did not do the upper section of the IHSMBR due to construction on the dirt road north of Warm Lake. The restaurant waitress said that the construction crew had turned back a couple of cyclists though other cyclists reported no problems getting through. turnoff on Phifer Creek Road as we were riding to Featherville. In addition to the logistical attractiveness, the IHSMBR has beautiful scenery at every turn of the route. 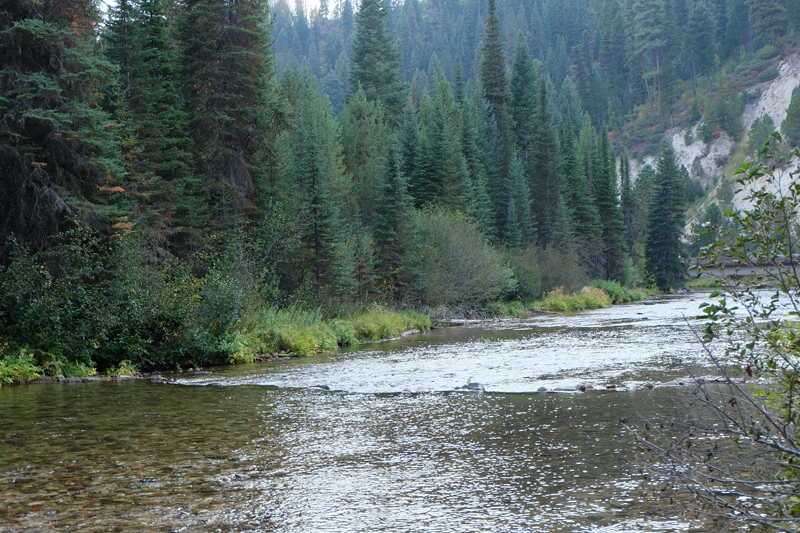 High mountains, raging rivers, a multitude of streams, endless forests, and of course hot springs. The ACA map lists 41 hot springs along the route, though 50 are listed on the website narrative. Dennis was in his glory soaking in as many of the hot springs that he could manage. One hot spring even came with a bathtub. He soaked in pools named Boiling Springs, Hot Springs, and a few which had less descriptive names and were simply lukewarm. For me, luxuriating in hot springs brings back memories of my 1960’s high school wrestling days sweating in hot whirlpool baths to lose the last few ounces to make weight that the amphetamines didn’t touch. However as an end of the day bath, the springs were wonderful. Lou Melini climbing. Lou’s mirror had seen better days. Though I am an experienced road traveller with limited dirt trails, travelling on a route composed primarily of dirt roads is a totally new experience. 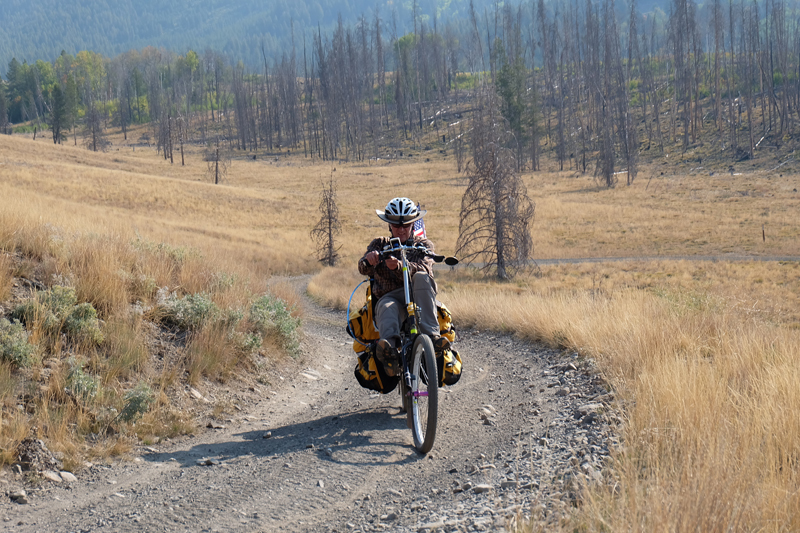 I was visioning bucolic rolling dirt roads on which I could ride with my camping gear for distances that would be upwards of 75% of what I could do when traveling on paved roads. I was naïve to the difficulty of traveling on dirt so I struggled to complete 30-35-mile days. Perhaps due to my age or overloading my touring bike, this trip was one of the more difficult tours I have experienced. Dennis and I experienced a few of the bucolic roads I envisioned though we were challenged by 8 mountain passes that found us pedaling in our lowest gear for hours. (I used a 24 chain-ring X 32 cassette low gear). Because we did not go to McCall we missed one of the more difficult climbs. Overall we averaged about 30+ miles/day, in part due to a few complications that we experienced. One of the complications was a quarter mile or so section of road between the Boise spur and Featherville being washed out- gone -under water! Someone had (thankfully) built a narrow trail to bypass the washout section. We took several back-and-forth trips for 3 hours to carry our panniers and push our bikes past this section. Reports of people trying to ford the river were unpleasant due to massive amounts of mud and sand coating their bikes. Another complication occurred when both Dennis and I managed to misinterpret the map for a 5-mile misadventure off the route, fortunately the only time we did that. However both of these complications were on flat sections of the route so we didn’t get to fully take advantage of the geography to further our progress but we obtained material for some good stories to tell. With of the number of intersecting dirt roads you will have to read the map carefully and have an accurate computer on your bike. The IHSMBR does not have latitude or longitude markings so you would need a separate map or download feature for GPS use. One rider we met had downloaded the IHSMBR onto his Garmin unit. They were able to follow the map and their unit told them if they were off-route. Dennis was unable to download the map at the time of our trip. After that experience I really need to force myself to learn more about software for bike travel. Even my Luddite nature is realizing the advantages. We used quite a bit of time stopping to check our maps to ensure we were on the correct road. 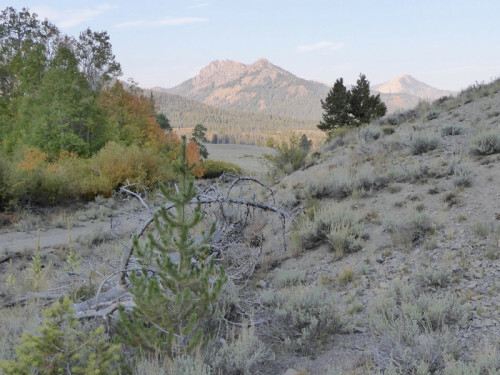 Many of the dirt roads we traveled were not signed with a Forest Service number and the IHSMBR map will state, “turn onto unsigned FR 277” as an example. How do you know it is FR 277 if there isn’t a sign! Additionally there were small roads that we came across that were not on the map adding a touch of confusion at times. For example, the mileage readings on our bike computers said we should have been at the “Y” on the map with instructions “to keep right at the Y in the road”. The actual “Y” referred to on the map instructions was another 0.15 miles further ahead, not the “Y” we encountered according to our computer mileage. The “Y” we encountered was not on the map. We were fortunately told “not to go to right at this “false Y” by a couple on their ATV. Part of the problem was that my computer mileage was off by about 0.1 miles for every approximate 8 miles of travel. Get the download and accurately calibrate your computer! Dennis and I started our tour in early September and ending it 15 days later. We rode 440 miles of the 517 IHSMBR. Starting in Ketchum, we rode the route in a counter-clockwise direction. Dennis had made arrangements a few days before departure to leave his car in the off-season completely empty River Run Ski Resort parking lot. After leaving Ketchum, there were ample places to pull off the trails to camp including quite a few Forest Service campgrounds. Water was easily obtained from the multitude of streams. The water in Idaho City and north to Placerville tasted bad, so bottled water was needed or filtering of tap water. 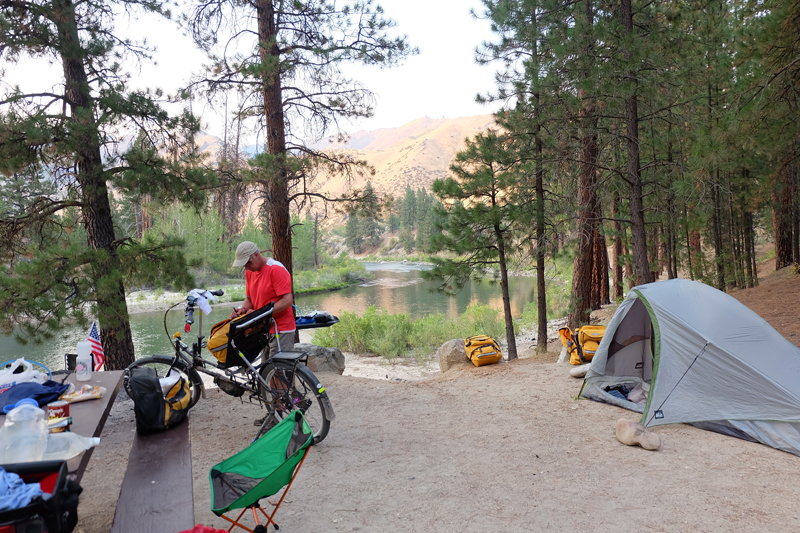 We stayed in one commercial campground in Cascade but the rest of the trip was devoid of commercial campground opportunities. Dennis rode a mountain recumbent bike. This bike bombed down mountain slopes and rode very well on the flatter parts of the route. It was a slug going up hill. He used tubeless 29 X 2.3” tires without a problem. I rode my fully rigid commuter/travel bike with 26 X 1.9” tires with tubes. The bike rode a little roughly on descents and washboard sections, fortunately very few of the latter. The bike climbed well and overall the bike was more than adequate. The strengths and weaknesses of our bikes were opposite that equaled us out in the end. Dennis and I packed our gear in panniers. We both could have packed lighter. The panniers were nice as there were a couple of sections in which we carried 3 days worth of food. It turned out this wasn’t completely necessary as Warm Lake had a small but nice café, and one could buy a lunch in Placerville and Featherville, places where we were unsure of what to expect regarding food availability. We came across about a dozen or so other riders on our travels. There were two Brits, a South African, a Dutch cyclist, a couple from D.C and the honeymooners from Portland. Most of the bikes were rigid mountain bikes, a few with shocks, one cyclocross bike, a fat-tire bike (doing an overnight ride) and the newlywed couple riding a Gates-belted, internal-hub equipped, custom Co-Motion mountain tandem. It was purchased in part as a wedding registry gift. They were also pulling a BOB trailer, the only riders pulling a trailer. The rest of the riders had “bike packing” set-ups on their bikes for lightweight traveling. Perhaps because they were traveling lightly, the majority of riders were staying in motels and eating out in restaurants. It was the first time traveling by bike that I felt like an anomaly with panniers. I was pleasantly surprised by the weather we had. Mid-September weather in Stanley and McCall should have been approximately 35 to 65 for the low/high temperatures. We experienced highs from 65 to temperatures approaching 90 degrees, on a few days. Of course the mountain passes were cooler. On the low side we had one night at 17 and another at 22 but the rest of the nighttime temps were from the mid-30’s to mid-40’s. We had one night of rain. Being September, we avoided mosquitoes, but the route description on the website mentions these little pests. Bicycle shops are located in Ketchum and McCall though Stanley has a small selection of bicycle parts. It would be wise to have new brake pads, chain, and perhaps a new battery for the bike computer prior to your trip departure. For your tool kit, include spare brake pads and chain link in addition to whatever you use to clean the bike, as it will be full of dust and dirt. I carried my usual overabundance of spare tubes but I only had one flat and Dennis had none. Cell phone service was spotty. I had better coverage with my wife’s Verizon service. 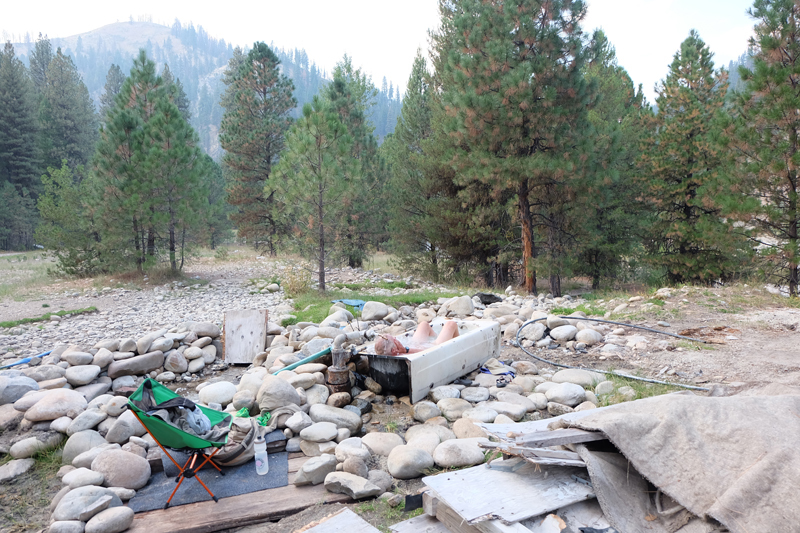 In Idaho City area, neither Dennis nor I had coverage. The Old Toll Road over Gelena Pass from Ketchum heading toward Stanley.